E-mail has evolved over the past few years to a point where people rarely see the plain text version of the message they send. With rich text elements ranging from signatures to screenshots and embedded pictures, the HTML/rich text version is now the default view even in most mobile phones. Beginning with iService 6, iService defaults to handling the rich text version of all messages. Whether you are viewing the customer question in the message queue or composing a ticket or note you will interact directly with the rich text version. This makes it much easier to read messages with tables or embedded images. This was accomplished by integrating a new rich text editor into every page within iService where you interact with a customer question or ticket. The rich text editor allows you to paste content into its text area such as a spreadsheet or image. You can also view or edit the underlying HTML of any message to clicking the HTML button <>. One unique feature that we developed to make the rich text editor more useful, is the ability to embed images into the text area (Unfortunately, Microsoft's Internet Explorer browser does not allow this within text areas). Since iService is a web-based solution, your browser typically doesn't know what to do with images pasted into the text area. We added logic to iService that identifies images you paste into the text area, and we save this data as the appropriate image type in the iService database. This is especially useful when making find answers knowledge base articles or creating mass mailing messages. If your technical support representative needs to explain how to use a system, for example, they can grab a screenshot and drop it into a knowledge base article or their response to the question. No HTML skills are needed. If you haven't tried this yourself give it a shot. It even works within the standard ask a question page in iService or any forms into which you embed the rich text editor. Just make sure you're using a browser that allows pasting into the text area, such as Firefox. As the use of mobile computing devices increases its more likely than ever that your customers will be looking for support while browsing on their phone or tablet. Over the past several years we have invested heavily in the iService forms interface, and that investment is paying off with an ability to easily make custom support portals for mobile and social media sites. You can now build your own support webpages optimized for mobile devices. These can include customized self-help pages, e-mail subscription or list management pages in a variety of forms to capture customer questions. We've been using JQuery Mobile for our mobile support sites and have found it very easy to use. We have a couple of examples that illustrate how you can combine the knowledge base, ask a question pages, and e-mail list management into a useful customer support portal optimized for mobile. Just point your phone to https://1to1.iServiceCRM.com/f/44 and take a peek. If you like the design of this site you can download the iService forms HTML from our website. If this is something you would like to seriously pursue, give us a call and we will be happy to walk you through the process or even build a complete site for you. This is a great reason to start using iService Forms and getting the most of your investment. 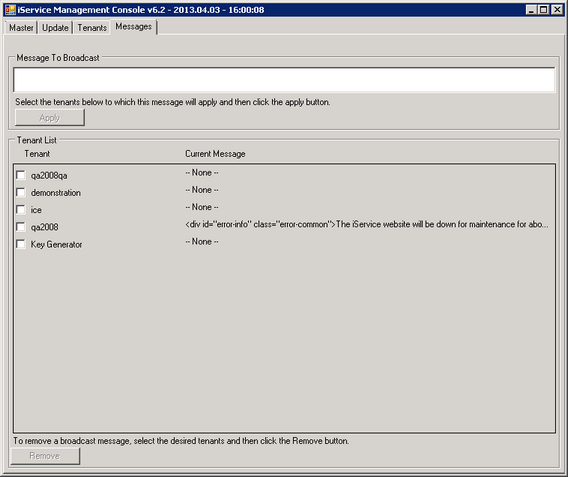 iService 6 includes a COMET server that supports real-time updates within your browser without reloading the web page. This is the underlying technology that will power the iService live chat solution in a few months, and we're taking advantage of its capabilities with the new broad cast messaging feature in iService 6.1. This feature allows you to push messages to your agent's browser, including HTML formatted content. We use it for sending operational messages to our hosted clients such as notices of scheduled maintenance. We also use it for our own iService support site to display links to forms and websites so our staff can have quick access. If you have iService forms that your agents need to use or links to operational sites that you would like always available to them, consider pushing them out via this broadcast messaging feature. You can learn more about this feature in the iService management console user guide. Note: these messages can only be delivered by system administrators with access to the iService management console. If you are an iService on-demand user, your account manager can work with you to get messages posted to your tenant website.